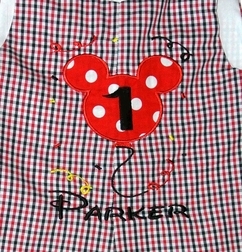 We adore this Mickey Mouse birthday outfit! We wanted another birthday idea for Disney Mickey birthdays, and thought how cute a Mickey birthday balloon with party confetti all around it would be. So, we had the design digitized for us by one of our favorite embroidery shops: glitzy stitches. We start with the adorable black, red and white tri check gingham (Mickey colors of course), and craft a John John, Longall or shorts. The shorts have black cuffs to accentuate one of the main colors in Mickey. 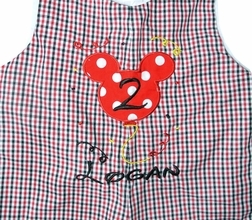 The front of the rompers and the white tee shirt paired with the shorts are appliqued on the front with our Mickey Mouse head shaped birthday balloon made with red with white dots fabric, and birthday party confetti tossed all around. Very festive!